I’m turning in my resignation for my day job today. I’m going to be a full time artist. But it’s been a long road to get here. And I’ve worked really hard. REALLY hard. And I have an amazing support system, and a part time job lined up to pay the bills… I’m not jumping off the cliff entirely. Stupid fear. Always showin’ up when you’re trying to do stuff. I’ll do it anyway – I just wish I felt more brave. But maybe that is being brave – the “doing it anyway” part. 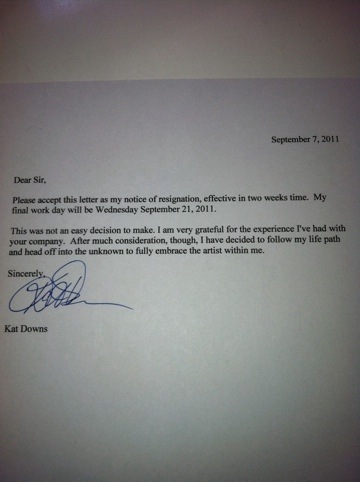 Regardless, I’m resigning today. Enter the beginning of a new life.